Maureen Valentine is a TCi Scholar and a first year Ph.D student in the department of Animal Science. 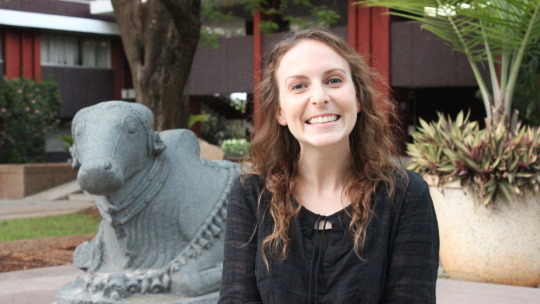 For her research, she plans to focus on the widespread deficit of biomass for animal consumption in India. Animal nutrition is a major limiting factor for dairy production, and if improvements could be sustained for better-quality feeding of dairy animals, livelihoods and human nutrition could be improved. One of the major constraints to dairy production in India, particularly in resource-poor, rural areas, is a lack of feed and fodder for livestock. Birthal and Jha (2005) estimate that feed scarcity is the most important constraint in the dairy industry, and accounts for nearly half of all losses in Indian dairy production. An expected deficit of 65 percent of green fodder and 25 percent of dry fodder is expected for Indian livestock by 2025 (Singh, et al., 2013). Additionally, increased pressure on land for production of human food crops from the increasing human population leaves little available land for further forage cultivation or feed production to nourish livestock. As a result, livestock predominantly depend on crop residues as their main source of feed (>44%) in much of India (Singh, et al., 2013), which are notoriously low in nutritional quality: high in fiber and low in crude protein. These issues coupled with a rise in demand for dairy products due to urbanization and human population growth have warranted research on better utilizing crop residues and improving diets for ruminants in India to increase milk production. During this trip (June 15 – July 25, 2015), I will be traveling to five different places in India to explore potential research projects for my dissertation. I will return to India at the beginning of 2016 and stay for roughly one year to complete my dissertation field work. For this current trip, I will travel to Hyderabad, Karimnagar district (of Telangana state), Karnataka, Bihar, and Jharkhand. My trip began at the ICRISAT facilities in Hyderabad to work with collaborators at the International Livestock Research Institute (ILRI). We discussed their current projects involving feed and fodder in India, and decided the best places for me to visit in these six weeks. Now, I am in the Karimnangar district of Telangana state, which is about 130 km north of Hyderabad. I am traveling with a vet student from the University of Pennsylvania (Gretchen Landin) to look at the Mulukanoor Dairy Cooperative. 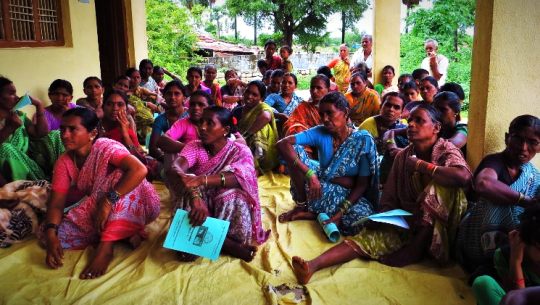 Dairy cooperatives are a popular grassroots model in India for the procurement of milk. This cooperative is running a successful model, and many people come to understand the structure of their organization for replication in other areas. This cooperative has nearly 21,000 female members. One new service offered to cooperative members is a ration balancing software that has been distributed by the National Dairy Development Board (NDDB). This ration balancing project began about a year ago and involves tagging buffalo and cows, and then keeping records of those animals’ milk production, age at first calving, calving intervals, health problems, and suggested feed rations. Mulukanoor Dairy Cooperative plans is continue tracking these animals for at least 5 years to measure changes to health and milk production. After one year, the project has already seen minor changes to milk production and corrected milk fat, and major reductions have been made in ration costs. 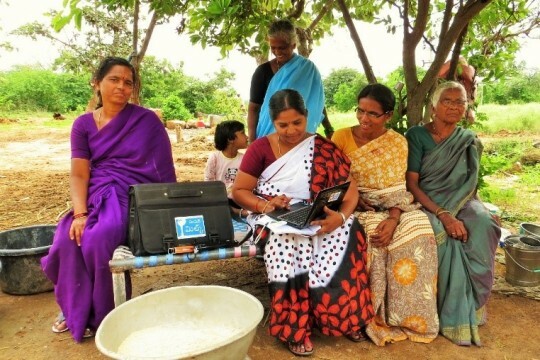 It has been interesting for me to see how this technology is getting implemented at village and farm levels, and to see the structure and organization of their data collection. Gretchen and I got our photo in the paper. We had attended an information meeting about the farmers’ local bank and lending office and a representative got a photo of us afterwards. Also, we apparently made it into the local paper. We aren’t sure exactly what the description says because it’s written in Telugu, but I think it says that we are doing some dairy related research. My next stop will be Raichur, Karnataka, which is the state southwest of my current location. ILRI has a newly established project in Karnataka, and I observe how that project is getting executed. This trip has already been a great learning experience as I’ve come to better understand the constraints facing livestock feeding in India. I am looking forward to the next four weeks as I am sure I will have a whole new perspective on my research going forward.